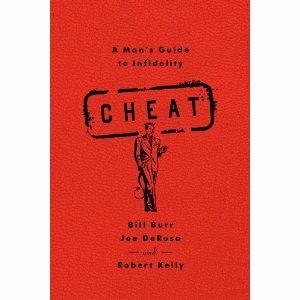 Comedians Bill Burr and Joe DeRosa, along with Robert Kelly have put-out a compelling, fun, and slightly sarcastic read called Cheat: A Man’s Guide to Infidelity. With chapters titled, “Going Global,” about cheating around the world, “Getting Out Alive” all about getting busted or getting out of the cheating game and the wonderfully apt “The Art Of Deceit” subtitled ‘Lying Like A Woman’ you’re really bound to get all you ever need from this little soft cover. Given the above, nobody will expect this snarky tome to play to the ladies, but Cheat: A Man’s Guide to Infidelity is a hoot, a primer for men doing it or thinking about doing it…or dealing with their guilt after the fact.